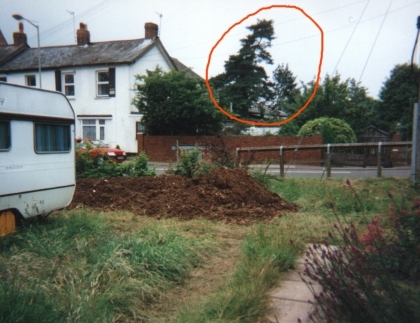 Photograph showing trees in the Conservation Area of Sidford before they were felled in March 2003 as part of clearing the land prior to submitting a planning application for new housing a year later. Events are described in a letter to the Environment Agency. This page contains several photos - please allow time for them to load. The penalty for illegal felling is up to �,000 per tree but there are few prosecutions because detailed evidence has to be produced as to the size and type of tree(s). This is usually not available if all the 'evidence' is quickly removed from site or burned. The professionals who undertake these clearances know exactly what they are doing - and with likely profits (in the case described) of up to �0,000 for the site owner if planning consent is obtained, even fines of �,000 (more usually �0) may seem a good bet. Court orders to reinstate land that has been illegally cleared are virtually unknown. The whole system of designating Conservation Areas and Tree Preservation Orders appears to be an ineffective bureaucratic shambles. I referred to these problems in one of my election addresses dated April 2003 - the material is achived here. Photograph taken in July 1998 from the author's garden. Trees in the garden of 'Village End' effectively screened the industrial buildings of Hamilton Garage. In 2003, the tree cover was probably more extensive than is shown here. 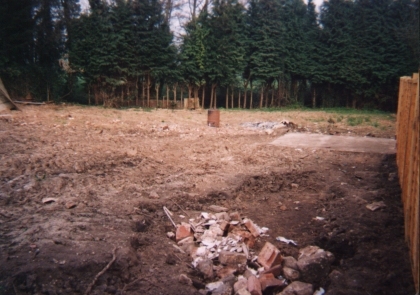 Despite being in a Conservation Area, the site was cleared in March 2003 and a planning application submitted for four new dwellings in March 2004. 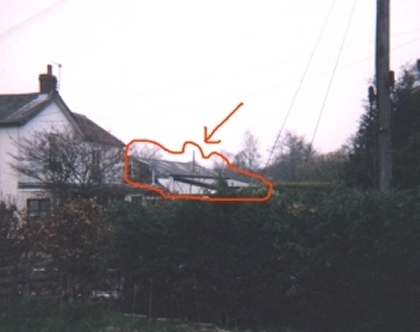 Taken in March 2003 from a similar position in the author's garden. The industrial buildings and chimney of Hamilton Garage are clearly visible. Previously they had been well screened by trees in the garden of Village End. In the intervening 5 years, the hedges bounding the author's home to the front and side had grown well: the beech hedge is shown still in its autumn colours. The leylandii are drab green (as ever!) but provide a good screen from the main road. Taken from the rear car park of Hamilton Garage and looking to the south east, this shows the desolation that once was a mature lush garden full of trees, shrubs and wildlife. The remains of a large bonfire can be seen, as can an old oil drum used for further burning. Trees were felled using chainsaws, the land was levelled, and roots were removed using a 'JCB' digger. Showing a 'pit' perhaps the remains of a tree. Aerial photos from c.2000 suggest it might be the remains of a pond. 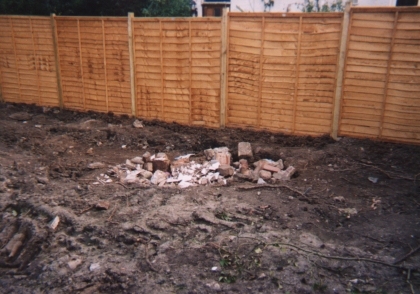 The new fence panels were installed to divide the garden of Village End into two - an area left as garden for the new tenants and the area shown here destined (so it was claimed initially) to become commercial car parking to the rear of Hamilton Garage. Looking almost due east towards the river, the extent of 'total land clearance' is most clearly evident from this photograph. Aerial photos show extensive tree cover around the area of the bonfire. The date of the photographs shown here is uncertain - sometime around mid to end of March 2003. When at my request an officer of EDDC visited Hamilton Garage on 9 March 2004, saying she understood that some trees had been felled, a member of staff said to her "Oh I hope not!" 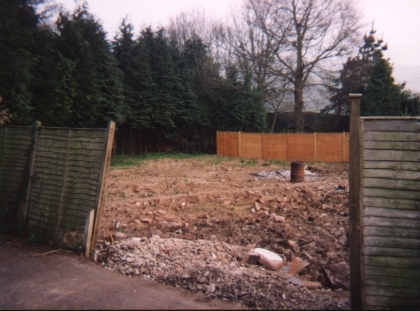 In the planning application to build 4 houses and 8 parking spaces on what was the verdant garden of Village End, within the Conservation Area of Sidford, the site shown above was described as 'vacant land'. No impartial planning committee could surely argue with that - it is clearly crying out to be put to good community use helping to solve the housing crisis! Indeed, tidying up the edges and installing a few hanging baskets might make it worthy of a Britain in Bloom award for environmental excellence. It really could happen in Sidmouth! It appears that this is not the first time in East Devon that these types of events have taken place. Details are being obtained. The serious questions include why public money is spent employing tree officers, conservation officers and other bureaucrats if they are incapable or unwilling to take effective action over abuses of the planning system. Similar comments have been published about the effectiveness of Sidmouth Town Council.